Do you like waiting in line? I sure don’t. Worse than just the waiting part is not knowing how long you will be there. Even worse is not knowing whether you will be able to get your problem addressed if you do finally get through. Isn’t it fantastic when you visit a website they offer to call you in 5 minutes or offer a timeslot to pick. You know that if you call up a central number for customer support, you’ll have to wait in a queue most of the time. It is so much nicer when the business you are paying offers to wait FOR you. Almost 70% of customers say that waiting in a call is one of the main reasons for a negative experience. You can find out more about that and other research outcomes here: Infographic on the relationship between contact center capabilities and impact on customer experience. So we know that your customers, and everyone else, basically hates waiting. We even know that on the flip side, if you solve this for your end users, they actually love it, i.e. they share the experience, they talk about it, they recommend you because of it. The “soft” case for changing to a “zero or low waiting” policy is absolutely clear. Why do most call centers make you wait? are there some barriers preventing call centers from fixing this? does it cost too much or have a poor business case? The answer to both is “NO”. There are no technical barriers. Even though it does require deeper integration and more automation, the technical problems are now easily solved. And secondly, the business case is actually very strong. And yet, very few medium-sized or larger call centers offer to wait for you or auto-schedule in a reliable way. So what is going on? Sometimes I am tempted to think that the first point can be ignored: If someone has no interest in solving issues for consumers, then maybe they shouldn’t work in CX or customer service. Unfortunately, inertia is common in our industry. Many contact center leadership teams simply decide not to solve the “waiting”problem. Since the case for solving the issue is so well established, then not doing it seems close to ridiculous. However, as I’ll outline below, the reasons for inactivity on this issue are often related to misconceptions about what good call center performance means. In addition, the goal posts are moving, so what you might regard as ok in your time-to-answer SLA before actually turns out to be inadequate for many cases now. As we shall see, this is also why putting off solving the “waiting” issue makes the problems worse for your business over time. As for point 2, the tech part is solved: Just get into the no-code integration and automation revolution. Yes, you will need to change how you do things. Yes, you will probably move some parts to the cloud and use “as a Service”. Yes it is different from the way you did things before. But it is technically not difficult. So bite the bullet. Your customers deserve to have their time respected – they are paying your bills after all. Point 3 turns out to be bogus: The total net benefit of the transformation to “zero waiting”, or “low waiting”, will not only save money, it will actually finance several other core CX optimizations. Yes you read that right. Tackling the waiting problem will actually bring you net benefits that more than pay for themselves. The short explanation is this: The integration and automation capability you need actually fuels a whole load of productivity and revenue and/or margin improvements. But it is well worth digging into the longer explanation as well. Why does moving to “zero waiting” actually make you more money? A peak in demand is an unfortunate blip in your otherwise quite satisfactory metrics. 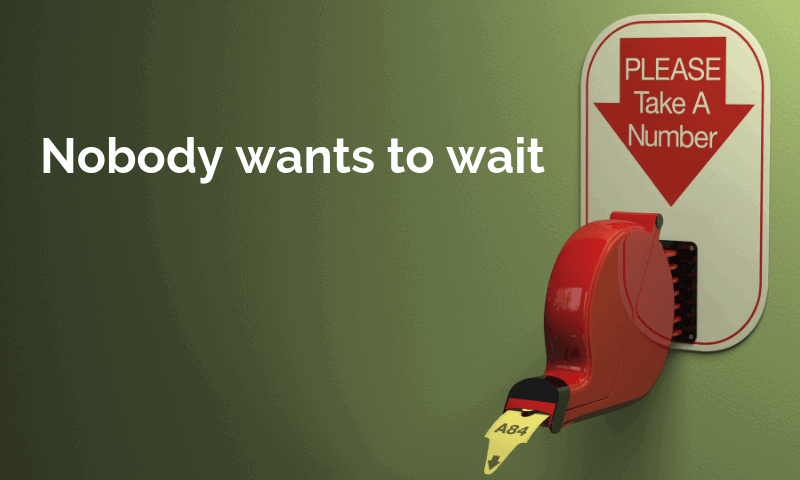 We answer 80% of callers within 20 seconds of entering a queue – so all is good, right? Keeping 70% of callers in IVR for about 20 seconds and waiting for a further say 15 seconds is not a problem. In a peak, 40% of callers wait more than 3 minutes. The 80 in 20 seconds is the average! As your competitors (and call centers in general) move to “zero or very low waiting”, the impact on your customers and on the bottom line will get worse: You will not meet consumer expectations. This is not because you are doing badly (statistically). It is because doing well statistically (80% in the satisfactory case), means that you are simultaneously doing badly for others – that is simply in the nature of doing well enough … statistically. The thing is, as long as there was no way to deal with the waiting, it did not matter to your operations: 80% in 20 seconds was adequate – even good performance. But now that there are much better ways to deal with requests to call you, 80-20 has become just ok – even the minimum acceptable. So what is the best way to fix the waiting problem? Unfortunately a lot of businesses are purchasing niche point solutions in an attempt to fix the waiting problem. Each of these, for example standalone Virtual Queuing or Call-back in IVR are basically bolt-ons that attempt to solve the issue with a hack. This is not optimal even for a quick implementation. But even worse it makes it impossible to improve further after initial deployment. If any one of these elements cannot be changed flexibly, then you will have a problem optimizing the workflows involved in dynamic systems to prevent or dramatically reduce waiting. So if you want to master the new zero waiting discipline, one necessary component is the ability to create automations that join the dots between all your integrated systems in the call center.